Courtesy of Love Hawaii Realty. A truly one-of-a-kind luxury oceanfront resort condominium in the highly sought-after angled 01 stack in the Beach Tower at the Beach Villas at Ko Olina, on Lagoon 2. This spacious 3-bedroom Villa conveys a real sense of beauty and sophistication. Meticulously maintained and upgraded by the sole Owner, with brilliantly polished travertine natural stone flooring, mahogany cabinets, granite countertops, SS appliances, $80k in custom cabinetry and furniture, custom lighting, and designer furnishings throughout, all convey the clear pride of ownership, with no expense spared! Never rented; strictly a second home. This Beach Villa presents itself as though it were a recently built condo! Both private and exclusive, this Villa includes two covered parking stalls and an Owner’s storage locker. Please, send me more information on this property: MLS# 201901311 – $1,775,000 – 92-102 Waialii Place Unit B-401, Kapolei, HI 96707. 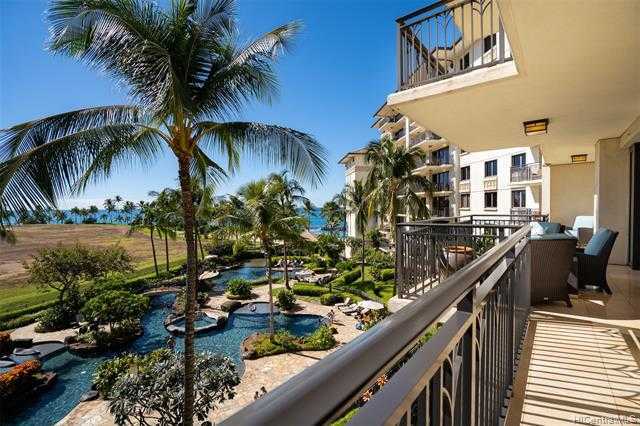 I would like to schedule a showing appointment for this property: MLS# 201901311 – $1,775,000 – 92-102 Waialii Place Unit B-401, Kapolei, HI 96707.